Our Bach has been a labour of love and we are excited to share it with you. It has been tastefully decorated using a blend of rustic and coastal interior design elements. Inside has been has been completely refurbished. It is light and airy and the living area is an easy space to relax and unwind in. It is the perfect space for two families to share as the adults can enjoy the spacious bedrooms with comfortable beds and quality duvets whilst the kids can enjoy hanging out in the garage bedroom, playing table tennis and darts. The house has three comfortable queen size beds and the bedroom in the garage sleeps 4 (perfect for the kids!) The garage is equipped with a table tennis table and darts. The deck and outside table is perfect to enjoy the morning sun and relaxed brunches. Spend the afternoon chilling out in the outside cabana and in the evening use the BBQ to cook up some delicious dinner cuisine. Within minutes you will find yourself walking along the 10km stretch of surf beach or enjoying the water sport haven of the inner harbour. Around the corner walk to the harbour where you can launch the boat, fish off the wharf or enjoy a meal at the boatclub. A quick 5 minute car ride will take you to the picturesque Anzac Cove where all the family can swim, kayak, paddleboard or just enjoy lazing on the beach. Waihi Beach boasts great cafes and there are some lovely shops to wander around. Other places to explore and enjoy include Cave Cove, Shelly Bay, the Athenree Hot Pools, Waihi and the walking and cycling tracks of the Karangahake Gorge. Go a little further and you can spend a day antique shopping in Paerora or travel 45 minutes to Tauranga. If you are new to BookaBatch please include additional information about yourself (home phone number, address, additional names of adults in your party). Pets can be negotiated, at a charge of $10 per day. If you do not want to hire our linen, please bring your own -3 x queen sheets/ 4 x single sheets, pillowcases and tea towels and towels. Garage doubles as a games room, equipped with bedroom. Perfect for the kids! Perfect location... no need to spend all day long at the beach with little ones when you can come and go as you please. The bach was divine. Clean, Tidy and exactly as described and pictured. It was a home away from home. The kitchen has everything needed and then some. Just a gorgeous home in a gorgeous location. Hope that we will be able to rebook next year. Thank you so much for letting us use your lovely home. Cute, modern bach close to the beach but with a private lawn area. Cute, modern bach close to the beach but with a private lawn area. Very well equipped! Could have stayed for much longer. Great property-especially for young children! 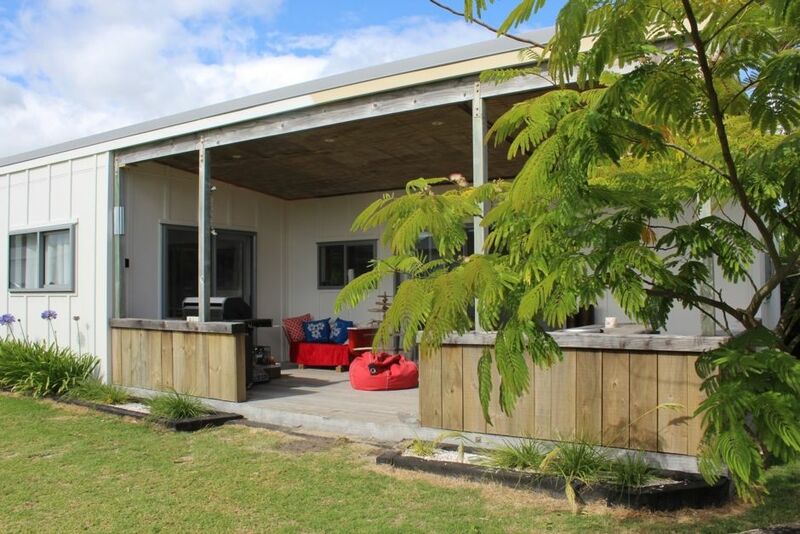 Great property-especially for young children! All enclosed and safe! So close to park, beach and had everything we needed and more!! Will be going back again!! Awesome property - We loved our stay here - it was too short! (Obviously our fault!). Awesome property - We loved our stay here - it was too short! (Obviously our fault!). The house is lovely, well looked after and well equipped. Nice and close to walk to the beach and other facilities.